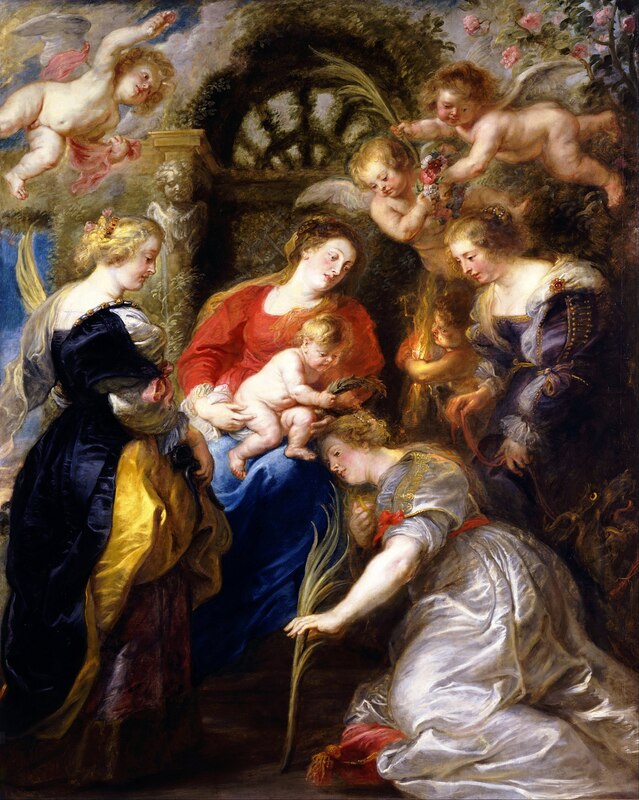 The Crowning of Saint Catherine by Peter Paul Rubens does not, in fact, depict the moment that the top of Saint Catherine’s head enters the world as she is born. Au contraire, it was the moment that she was martyred. In this artwork, Saint Catherine is surrounded by a particularly badass group of women – namely, the Virgin Mary, Saint Margaret, and Saint Apollonia. We all know what Mary did to get martyred, but lesser known are the stories of Saint Margaret and Apollonia. Saint Margaret, on the far right, was born to a pagan priest. So when she converted to Christianity, her father kicked her out. Flash forward a few years and Margaret has herself a marriage proposal from the Roman prefect named Olybrius, a non-christian. She says in so many words, “Ew, no,” to which the prefect responded poorly. He tortured her and threw her in jail, where she encountered Satan in dragon form. The dragon swallowed her whole but when Margaret made the sign of the cross, the dragon split apart, leaving her untouched. Impressive… The next day after the torture and attempt to drown her failed to make her denounce her faith, Margaret was beheaded. But in this painting, you can see her holding the leash of the dragon (satan). Interestingly enough, she became the patron saint of pregnancy because of the whole being essentially birthed by a dragon thing. The second saint in the painting, Apollonia, was a well-respected deaconess. A mob seized her and tried to force her to say sacrilegious things. When she refused, they either broke or pulled out all of her teeth. Then they collected a group of people and told Apollonia that they would die if she didn’t say the impious things. She responded by asking for a little room in her binding. When they gave it to her, she jumped in the fire and burned to death. She is depicted in this painting holding the pliers used to extract her teeth. She became the patron saint of toothaches, though you’d think she would be unsympathetic to someone with just a toothache as she endured much worse. And last but not least is Saint Catherine, the painting’s martyrdom honoree. Her story is widely doubted but here it is. Catherine was an incredibly smart young girl and when Christians were being persecuted under the Roman emperor, Maxentius, she protested. Maxentius had the most accomplished scholars debate her faith and when she won, he had her tortured. She claimed to be married to Jesus and to have consecrated her virginity to him, after which she was sentenced to death. She was sent to “The Wheel,” a torture/murder devise, but when she touched it, a lightning bolt miraculously shattered it. Maxentius saw a way around this though and had her beheaded. She became the patron saint of scholars and philosophers and is shown in the painting observing a palm tree branch, which is a symbol of the martyrs. Above her, baby Jesus is crowning her with laurel leaves. This painting is magnificent as as such was highly sought after, especially during World War II when Nazi-looters took whatever they wanted from the homes of Jewish people. This piece was originally made for the Church of the Augustinians in Mechelen, Belgium in 1631. The church sold the piece in 1765 to a collector, who in turn sold it to the Duke of Rutland in 1779. The piece remained in the Rutland family’s collection until 1911 when Leopold Koppel, a German-Jewish banker and entrepreneur, bought it. When the Nazi party rose to power, Koppel was pushed out of work via the aryanization of German businesses. He “died” in 1933 and Hermann Göring, a high-ranking Nazi, swooped up the work for himself. Through the chaos of the war, the piece ended up, along with many others, in a salt mine. It was later reclaimed by Albert Koppel, Leopold’s son who sold it to the Toledo Museum of Art after the Met turned it down. They are still kicking themselves for the mistake. If you thought this article was remotely interesting, you can watch the movie version, The Monuments Men, directed by George Clooney. Bauman, Barry. "Historical Rewards: A Dutch And A Flemish Discovery." Baumanconservation.com. Web. 20 Mar. 2018. "CATHOLIC ENCYCLOPEDIA: St. Apollonia." Newadvent.org. Web. 19 Mar. 2018. Clayton, Mary, and Hugh Magennis. "The Old English Lives Of St. Margaret." Google Books. N.p., 1994. Web. 19 Mar. 2018. Knight, Christopher. "The Monuments Men Did More Than Rescue Nazi-Looted Art." latimes.com. N.p., 2014. Web. 20 Mar. 2018. "St. Catherine Of Alexandria | Egyptian Martyr." Encyclopedia Britannica. Web. 19 Mar. 2018. "The Crowning Of Saint Catherine – Works – Toledo Museum Of Art." Emuseum.toledomuseum.org. Web. 20 Mar. 2018.